Captain Ulbrich has the physical ability to perform any duty in the Corps, but his MOS strikes at the heart of the mission: to make sure every man comes home. In overseas missions, service members sometimes disappear. Maybe they&apos;re taken captive or lost in the rush to evacuate—it&apos;s not always clear. But long after the mission ends, Marines like Captain Kris Ulbrich search for answers. They track down the lost prisoners of war and service members missing in action. This is a hefty task, but Marines like Ulbrich are trained to handle heavy lifting. 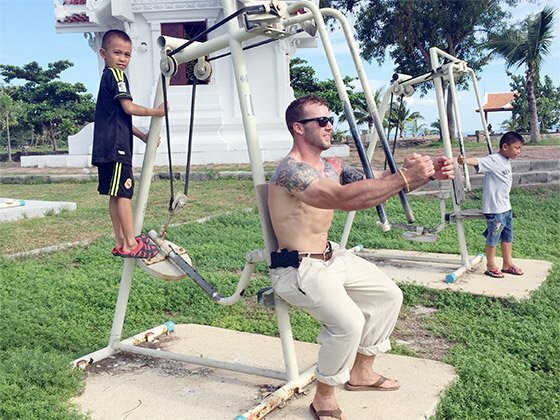 And even more impressively, he does this while handling his own training, working as a fitness coach alongside his figure-competitor wife, and competing himself. This military bodybuilder juggles crazy responsibilities, all while looking like a shredded beast. We can all learn a thing or two from him. What inspired you to join the military? What are your duties? I feel that it&apos;s important for everyone to pay their dues to their country. Joining the Corps was my way of paying my dues. After joining and having exposure to the true culture of the Marine Corps, I developed a second family, stronger values, and a sense of purpose. I enlisted while attending college. Drilling once per month, I served my time as a reservist, balancing military and college requirements. I never took part in an ROTC program. Today, I am a Recovery/Investigating Team Leader at Joint Personnel Accounting Command (JPAC). My responsibilities include planning and executing recovery missions of missing United States military service members from previous wars. How did your tours of duty change the way you look at fitness? Both tours offered different challenges. Afghanistan forced outside-the-box thinking to accomplish fitness routines. Sometimes a sandbag was all we had. Service members learn to push through no matter how austere the environment, lack of sleep, or amount of stress you incur. Resilience became essential in the constant fight with complacency. Finding methods to motivate myself proved difficult at times. However, motivation became a force multiplier with the Marines I served with. Seeing them constantly push themselves and use fitness to cope with the stress of combat was truly remarkable. While deployed in Japan and South Korea, I was training for my first physique competition upon my return. I set a high training standard to ensure I met my goals of being stage-ready. In the process, I learned the importance of sticking to a training and nutrition plan, planning ahead for unseen circumstances (meal prep), and allowing nothing to alter my goals. I shared this knowledge with my Marine colleagues and they too began their fitness journey. Having experienced these lessons, I have seen what hardships the human body is capable of overcoming, especially if you put your mind to it. I take these as lessons learned. I incorporate them into my own training, as well as anyone I train. After being exposed to the different cultures of Afghanistan, Japan, and South Korea, I have gained yet another appreciation for the lifestyle our country&apos;s freedoms allow us to choose. Prior to these deployments, I was aware of the social and financial restraints some foreign countries face. I never imagined the impact of these restraints, such as lack of basic nutrition, gym access, or access to general fitness knowledge. To be healthy and fit is more than a choice. It is a freedom, and I wish more people took advantage of it. What is the biggest obstacle in leading a military lifestyle? Not becoming consumed by and completely dependent on the military lifestyle. It is easy to put on the blinders and only expose and apply yourself to your duties as a Marine. Continuing development of yourself in education, advanced fitness training, and setting goals outside of the military seem to be points of struggle for a vast majority. How important is it to you to perform well on a PT test? As a leader it is important to set the standard. The Marine Corps heavily stresses its high PT standard. Though the PT test is only used as a gauge to evaluate where Marines stand in refined physical abilities—pull-up, sit-up, and 3-mile run—it provides leaders the ability to make more informed decisions, and separates the go-getters from the slackers. "Though the PT test is only used as a gauge to evaluate where Marines stand in refined physical abilities, it provides leaders the ability to make more informed decisions, and separates the go-getters from the slackers." Personal sacrifice is an accepted part of the military. How does that translate to fitness? Generally, service members who excel in the military will excel in fitness. Some of the principles the military harps on—discipline, commitment, and ability to train to a standard—are the key qualities which separate the average gym-goer from a successful athlete. The ability to make personal sacrifice easily transfers into a fitness-driven individual, whether it&apos;s the ability to push for the final repetition while lifting, to say no to Friday night dinners out and drinks, or the ability to get up before work for a workout. From annual reviews to career opportunities, fitness is a key element of any service member&apos;s role. In combat, it can mean the difference between life and death. We train like we fight, and fitness is on the top of the list. In one of our forward operating bases (FOBs) in Afghanistan, we hung a huge sign that said "Train like your buddy&apos;s life depends on it". The reality was, at any moment your buddy could be injured, and it&apos;s up to you to get him out. These rare but extreme circumstances help drive the importance of fitness in the Marines. How did you get started in bodybuilding? Did your perspective change after you took the stage? My weightlifting aspirations began back in high school for the purpose of sports performance, specifically soccer. During my junior year, I began lifting with my friend&apos;s father, Brian Boyd, a 2000 Mr. Georgia competitor. His accomplishments and mentorship were inspiring, becoming a catalyst for my interest in the sport. However, it was my wife, Alyx Ulbrich, who gave me the confidence and educational background to compete on stage. Her passion for fitness gave me a renewed passion for competitive sports, something I had lost touch with once I ceased playing rugby after graduating college. Her accomplishments and continued support have served as a great source of inspiration and allowed me to excel in this rejuvenating competitive sport. "It was my wife, Alyx Ulbrich, who gave me the confidence and educational background to compete on stage." We hear Marines brag all the time about how they&apos;re the toughest of all military branches. Do you think that&apos;s a fair assessment? I do. As Marines, we are trained to always be ready to fight on the land, air, or sea. Due to the rigorous training requirements, high physical and moral standards, and countless heroic acts on the battlefield, the Marines have proved time and time again that they&apos;re the roughest and toughest in the military. My workout plan changes weekly. I am a big believer of consistent change to make consistent progress. Here is a sample week. Weekends are a great time for a "cleanup" workout. I will hit an area that may need an extra lift or a better target workout. My wife and I also try to hit a fun active cardio, such as kayaking, swimming, surfing, trail running, rock climbing, or road biking. "As a natural competitor I would be honored to excel to the level of professional status." I will train to the best of my ability during upcoming deployments in 2015 and compete in the last half of season. Other than that, I&apos;ll continue training, coaching, and inspiring our fitness team members for their future competitions. What would it mean to you to earn your pro card? As a natural competitor I would be honored to excel to the level of professional status and compete with the best the industry has to offer. How do you think bodybuilding helps you as a service member? Bodybuilding allows you to set tangible goals through structure, discipline, and exceeding your limits. These continual practices result in success, development of confidence, and increased performance. These positive traits translate into strong military leaders. Who are your favorite bodybuilders? Who inspired you? I&apos;d love to call out one of the professionals on this. However, at every local-level show I attend, I have had the pleasure of getting to know competitors who have balanced bodybuilding with their full-time lives, families, jobs, and all. Each is remarkable and inspiring. My wife&apos;s strict training, discipline, and drive to compete as both a national bikini competitor and figure competitor has not only inspired me, but set the bar to a new height. She keeps me honest and on my toes. What one tip would you give other bodybuilders in the military? Train like your buddy&apos;s life depends on it. This army infantryman makes sure that the boots on the ground are powered by a bodybuilding leg day. Take it from Mac: You can have it all! Military Bodybuilder Of The Month: Riley Is On A Roll! Physique competitors who work in the military can&apos;t think in terms of &apos;&apos;show&apos;&apos; or &apos;&apos;go.&apos;&apos; They need both. Luckily, the Air Force&apos;s Riley Marx has them in spades! 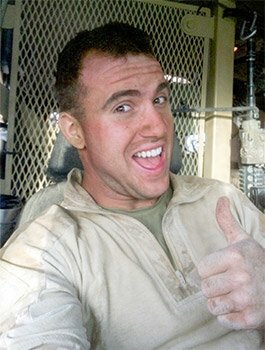 Military Bodybuilder Of The Month: Back In The Running! When depression tamped down on Brittany&apos;s spirits after a fateful battalion run, she used fitness to organize her emotions. She&apos;s come back better than ever and is now eyeing a pro card!